Stafford - February 9, 2017 GE Energy Connections (NYSE: GE) inaugurates its new Redhill Grid Automation manufacturing facility in Stafford, UK in the presence of Stafford MP, Jeremy Lefroy. Present in the UK for close to a century, this facility heralds a new phase for its Grid Solutions business, being selected as a pilot for GE's digital ‘Brilliant Factory' programme. The site was also recently honoured by a visit from the UK Chancellor of the Exchequer, Phillip Hammond. As the world's digital industrial company, GE is building a platform that will connect 50 billion devices, using its operating system, Predix. Through Predix, the Redhill facility will be able to combine decades of experience with cutting edge data science and analytics, which will improve productivity and efficiency. 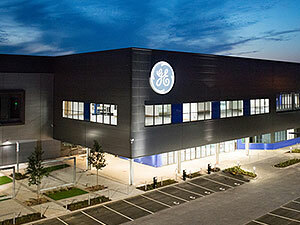 GE is the largest employer in Stafford, with around 1,700 employees. Approximately 400 people work on-site at the Grid Automation facility, manufacturing approximately 200,000 products per year, of which over 80% are exported. These products are an integral part of GE's digital substation, the heart of the digital grid. Digital substations manage real time information from high-end sensors and help utilities minimize asset downtime, keeping people connected to the electricity they need every day. Governments and utilities continue to strive for reliability, security and the integration of renewable energies, while focused on the need for greater efficiency. These factors push the move towards smarter grids, systems that are largely based on digital and information technologies. "I greatly appreciate GE's strong commitment to Stafford. This is shown by today's opening of the new Grid Automation facility and the ongoing construction of the HVDC and Systems factory alongside. They also run the UK's only large transformer factory on the Lichfield Road which supplies high quality equipment worldwide," said Stafford MP Jeremy Lefroy. "Stafford is ideally suited for research and advanced manufacturing with our highly skilled staff and position at the heart of the UK's transport network. I look forward to continuing to work with GE to bring further investment to our town", he continued. Mark Elborne, President and CEO GE UK & Ireland said, "Manufacturing is at the heart of what we do in the UK. Helping UK businesses and public organisations deliver efficiencies through our technology and innovation is a key part of our growth strategy. Our Stafford site is on the path to becoming a ‘brilliant factory', helping GE to drive forward the digital industrial revolution here in the UK." "Helping our customers generate affordable electrical energy and connecting people to it, all over the world, is what GE strives for every day," said Reinaldo Garcia, president and CEO of Grid Solutions from GE Energy Connections. "I am proud to be here today at the inauguration of this new GE innovation and manufacturing facility. This site plays an important role in supporting our customers in their digital transformation." GE is the third largest industrial company in the UK, with 22,000 employees and revenues of $5B annually. The Company will continue to invest in Stafford by developing an additional 180,000 sq ft manufacturing facility in the adjacent plot at Redhill to accommodate the High Voltage Direct Current (HVDC) and Systems operations.